Take Johan Schwartz, a BMW Performance Center Instructor, and take an unmodified BMW M5 sedan – what do you get? An event where the Guinness World Record for the longest sustained drift is smashed… by a lot. 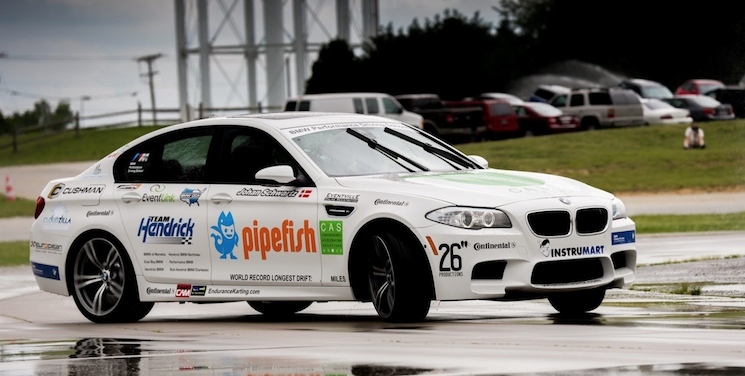 Schwartz recently took a BMW M5 and drifted the car around a skid pad for a total of 51.278 miles. The previous record was set in February in Abu Dhabi at a total of 6.95 miles. Schwartz complete a total of 322.5 laps around the 841 foot round pad. The record-breaking drift brought in over $20,000 in charitable donations for The BMW Charity Pro-Am, which benefits more than 150 different charities.